Home | Shall We Dance? Welcome to Dancing with Dementia! This blog will be used to bring you a vast array of information that will cover a myriad of topics, from advocacy, current events, discussions of various progressive dementias, upcoming events, nutrition, research and many others. Dancing is an activity that can be described as graceful, coordinated, and balanced, sometimes with missteps, sometimes with bruised toes, sometimes fast, sometimes slow, a waltz, a polka, a jitterbug or freestyle. Sometimes dancing leaves us invigorated. Sometimes dancing wears us out and leaves us breathless. Dancing is an apt metaphor for the rigors of caregiving which is filled with balance, missteps, grace, and moments of breathlessness. Some people describe stressful situations as walking on eggshells. Caregivers sometimes feel like they are dancing on ice. When a caregiver is well informed with regard to the progression of the disease, the cognitive abilities of the person, the skills needed to be as an informed caregiver as possible, caregiving can become a beautiful dance. As with learning to dance, caregivers must learn the steps, follow the rhythm, develop the routine, and even dance alone sometimes. The dance of caregiving can be a marathon, or a quick turn around the dance floor. It can involve friends and become a line dance, or it can all too often be a solo performance. 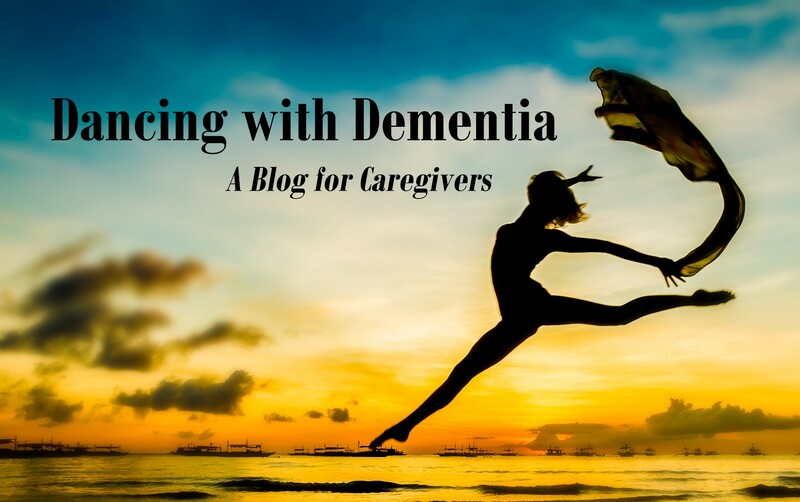 Dancing with Dementia will work to provide the reader with hope, purpose, skills, knowledge and techniques to reduce stress, and increase the quality of the life experience for both the caregiver and the person with the diagnosis. Caregiving is the most stressful occupation you will ever have. Didn’t realize it was an occupation? Well, it is and for most of us, one for which we have no training! Family caregivers do what they do for love, but love does not come complete with all the tools and skills we need to be successful in our caregiving roles. Caregivers all too often forget to care for themselves! Every caregiver needs to keep her or his own medical appointments, do something relaxing every day, eat nutritionally sound meals, and dedicate some time each day just for her or himself! Do you do that? Well, it’s a new year so make it a new year’s resolution! “I will do something JUST for ME today, and every day!” You can do it! This blog will help you keep that resolution. You will find more help through our training seminars, most of which are free to all participants. Sign up for those that seem most interesting to you. Join a support group. You should not do the work of caregiving alone. Support groups provide you with real time/real life solutions and recommendations being shared among people who are dealing with many of the same experiences. Caregiving, like dancing, is a skill to be learned. Shall we dance?